Nowadays, no one claps and cheers when we finish folding towels or scrubbing the sink. But there’s no reason we can’t still make bathroom cleaning a little more enjoyable! Are you with me? Please note, this post contains referral links. 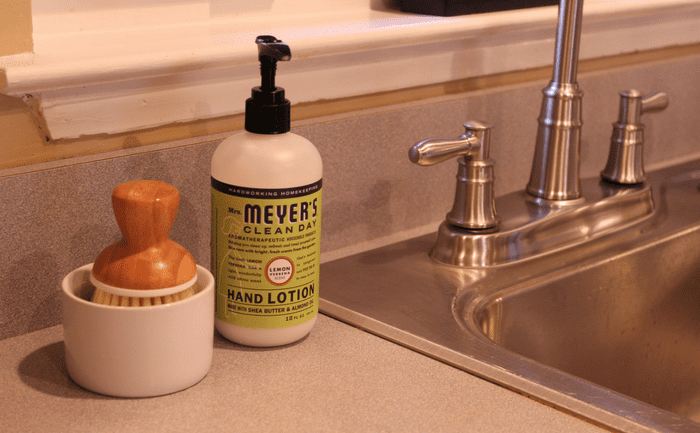 Start by grabbing this free Mrs. Meyers hand soap + $10 credit from Grove Collaborative! Then come back here for my tips to make cleaning the bathroom a little more fun. Cleaning the bathroom always feels like it takes forever, but you’d be surprised how little time tasks actually take. I like to set a timer like my mom used to do and see how quickly I can complete each task. For example, it only takes one minute to wipe down the counters and sink — and makes a huge difference in how clean our bathroom feels. Who knew? Nice smelling cleaners go a long way toward making the bathroom cleaning experience more pleasant. I actually look forward to using this Mrs. Meyer’s tub & tile cleaner — it cleans effortlessly and smells so fresh! I’m using the lemon verbena scent right now, but I’m looking forward to trying the lavender next time around. The best part is there are no harsh fumes, so I don’t have to hold my breath while I’m scrubbing the bathtub. We all know there aren’t enough hours in the day. So why not combine a few of tasks on your to-do list? Even though the bathroom is a small space, you can really work up a sweat. I like to see how many steps I get while carrying towels to the laundry room and taking out the trash. Plus, I do a few squats and lunges while I’m washing the floors and tub. I love hot showers and could spend all day in there. So while I’m enjoying the water, I give the shower walls and glass a quick scrub down to keep them shiny. 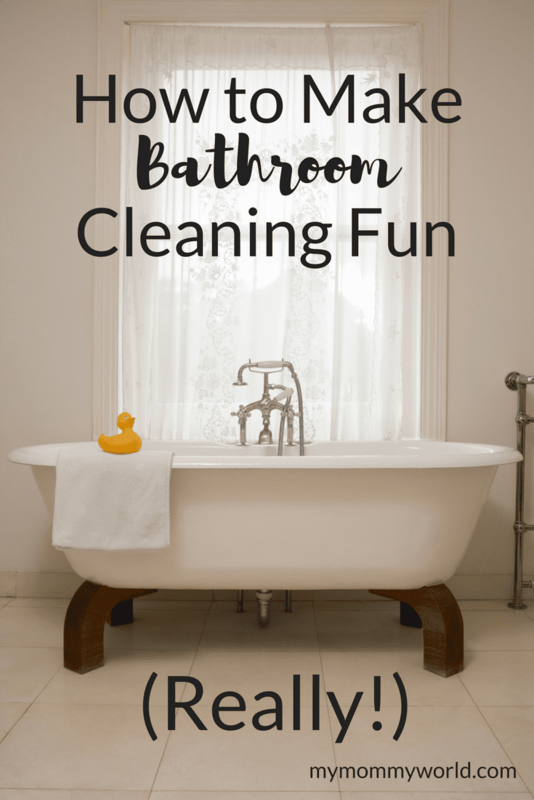 It makes cleaning the bathroom a lot less painful (and is a pretty productive use of water!). I stash my Mrs. Meyer’s tub & tile and Grove Collaborative scrubber sponge on the ledge in my shower as a reminder. The Grove sponges are perfect because the non-abrasive scouring side gets into the grout while the soft side gets the glass squeaky clean. Playlists are a great way to pump yourself up when you’re cleaning. But lately I’ve discovered that listening to audiobooks while I’m cleaning is a great way to catch up on reading that I wouldn’t otherwise have time for. I usually get so engrossed in my page-turner that the time flies by. Beautiful soaps, hand lotion, or a bouquet of flowers are a nice reward for all your hard work. 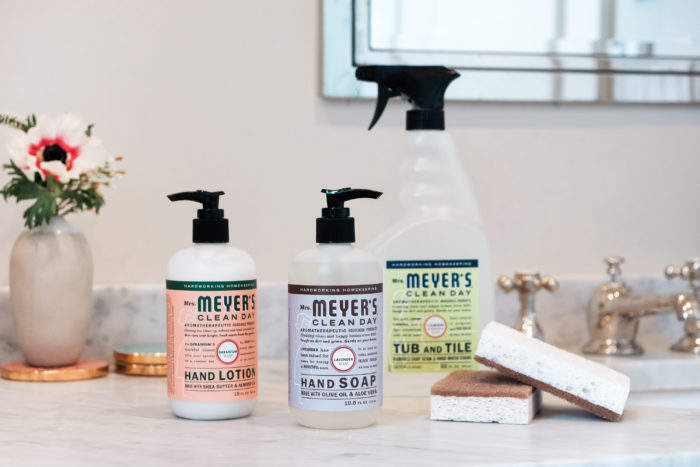 The Mrs. Meyer’s soaps and lotions are a super luxurious treat — no artificial scents here, just essential oils! I keep my Mrs. Meyer’s lemon verbena scented lotion (can you sense a pattern here?) next to the kitchen sink for easy reach. My hands are always so dry after doing the dishes! I used to hate running to the store for glass cleaner or toothpaste, but now I look forward to my monthly shipment from Grove. It feels like a present for me, but I’m actually helping my family stick to our budget! Grab your free kit and try Grove Collaborative now! I only clean the shower while I’m in the shower. It’s so much easier and it gets done so much more often too. We love Mrs. Meyer’s products too. They smell so good.